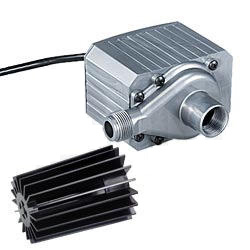 Pondmaster Magnetic Drive (Mag Drive) 2400gph Pump SHIPS FREE! 2400 gph pump w/18' cord. 265 watts; 2.50 amps. 1710 gph @ 3', 1630 gph @ 5', 1100 gph @ 10', and 720 gph @15'. shut off 18'. Powerful ceramic magnetic impeller is the only moving part which makes these pumps extremely energy efficient. Pumps can be used inline or submerged. 1" FNPT intake and 1" MNPT discharge. Includes pre filter. Limited 5 year warranty.